An advanced warehouse management system for NetSuite. Take your ERP implementation to the next level with Peoplevox’s Warehouse Management System. We don’t just sell WMS software; we’re experts in warehousing. Every project we undertake is unique. We’ll find the right solution for your business. Our WMS gives you control over all aspects of warehouse management, from goods-in through to despatch. It’s the key to a more efficient warehouse. The software has been built with Android and Windows compatabilities. The solution is fast, flexible and affordable: perfect for any business ready to scale. Why do I need a WMS and NetSuite? NetSuite is a very strong core financial and business system. It is designed to work for software companies, law firms, accountants, wholesalers, retailers and just about every other type of business that needs financial integrity and centralised information. It’s great. But it doesn’t cover every business need. Its two WMS systems (WMS Lite and WMS Enterprise) might not fit your business’s unique requirements. That’s why NetSuite have partnered with us. Our WMS is the ideal solution for any e-commerce company experiencing, or preparing for, growth. Peoplevox could be the scalable, powerful and flexible solution your company needs. How does the NetSuite integration work? NetSuite has a lot of functions. If any of these are tied to the warehouse, Peoplevox is ready to make them work smoother. 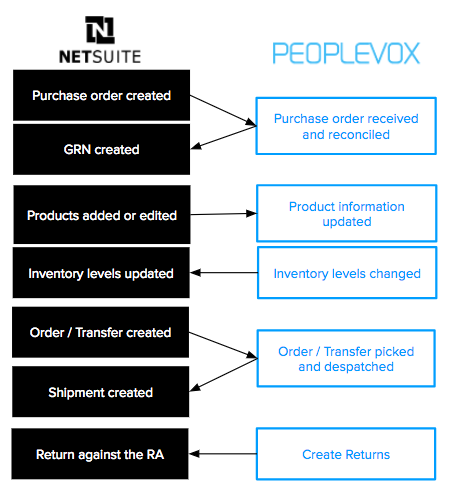 All of the touchpoints between NetSuite and Peoplevox can be seen in this flowchart. Peoplevox's WMS has a positive impact on all processes, from purchase orders being created through to order shipment and returns. It works to ensure fidelity across all processes. Everything is recorded, everything is accountable, everything is accurate. This means that there's no possibility of overselling, no room for human error, and no reason for any warehouse processes to create lag. Get in touch today to find out how Peoplevox can enhance your Netsuite site. For every vertical industry there are business challenges that require more niche solutions. 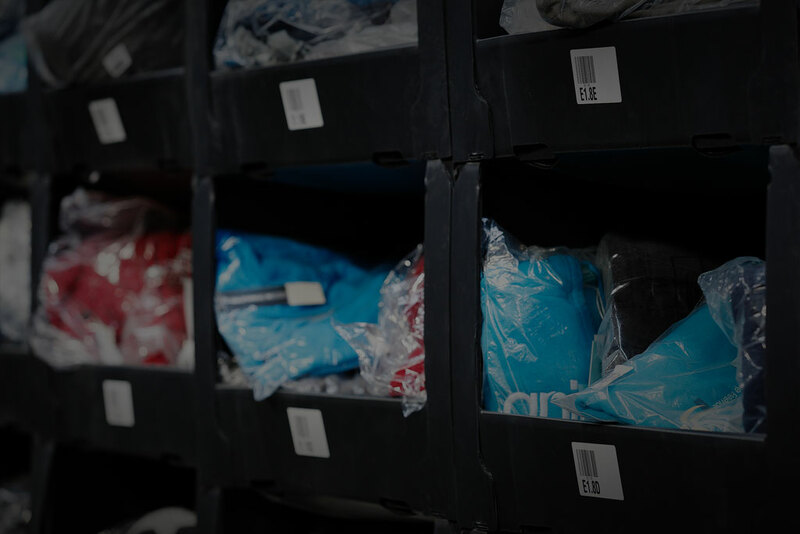 If you are a retailer, wholesale distributor or e-commerce business your warehouse and inventory management is a core function of your business. NetSuite has two WMS solutions; WMS Lite and WMS Enterprise. Considering these options in detail will help you to understand where our NetSuite warehouse management system can offer additional value to your business. Which should I implement first? This will depend on the technology you are currently using in your business and the challenges you are struggling with the most. Implementing our warehouse management system can be done more quickly than implementing NetSuite's ERP solution and our NetSuite warehouse management system. If you have an e-commerce platform that we can connect to directly, implementing our WMS and then introducing NetSuite at a later stage can minimise the risk of switching. Do I need NetSuite licenses for my warehouse? One of the benefits of using our NetSuite warehouse management system is that your warehouse team will use our licences, rather than NetSuite licences. NetSuite WMS applications that are native to the platform will require NetSuite licences. Can I use Peoplevox without an ERP like NetSuite? If you are scaling your e-commerce company you're sure to be feeling pain across almost every function of your business. The challenge is that most 'ERP' solutions that are built for small and medium sized retailers are not scalable, otherwise the biggest companies would be using them and they'd be enterprise solutions. As you're growing fast the demands of each part of your business change quickly and the type of solution needed will reflect these changes. 60% of our clients use our product in combination with their e-commerce platform, a CRM like Zendesk and an accounting software like Sage, Xero or Quickbooks. 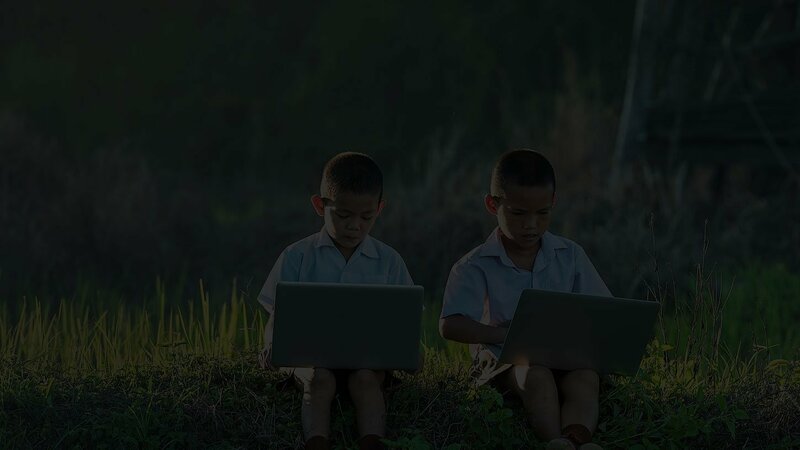 They've made a conscious decision to make their fulfilment scalable and get stock integrity their priority and can always add an ERP like NetSuite when they're ready.